Spring Valley, MN (Post-Bulletin) – Of all the stories Gary Peterson, of Spring Valley, worked on as news director at KAAL-TV, one has stuck with him. Since 2002, he and then KAAL news anchor Josh Benson, have investigated the 1995 disappearance of KIMT-TV morning news anchor Jodi Huisentruit, of Mason City, Iowa. “We can’t let this one die,” he said. 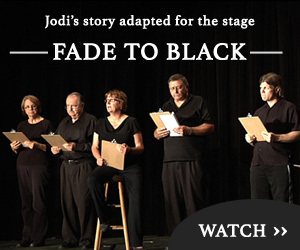 Gary Peterson of Spring Valley, Minnesota wrote ‘Fade to Black’ the story of the last few days before Jodi Huisentruit disappeared. Huisentruit, 27, was on her way to work when she disappeared on June 27, 1995, from her apartment complex parking lot in Mason City. There are no suspects in her case. Based on their investigation, Peterson and Benson produced a 14-part TV series that won an Eric Sevareid award for journalism excellence. They also went onto create the website www.findjodi.com. “Fade to Black” looks at the last days before Huisentruit’s disappearance, told using excerpts from her journal, letters and information from her family and friends. Footage and interviews collected by Peterson will be integrated in the production, she said. “It brings it to life that this a true story, and that it’s ongoing and not solved,” Neville said. Yet the play isn’t a news cast, she said, explaining that the goal is to reveal who Huisentruit was as a person, not just a statistic. Opening night falls on the 17th anniversary of Huisentruit’s adbuction and possible slaying. Peterson, who will serve as the narrator of the play, also will answer questions about the case at the end of each production. “The answer is out there,” Peterson said. Wish I could see that performance…..